Home » All Genders » What’s in a name? I have done lots of paintings that involved animals, but my latest commission illustrates (excuse the pun) a really great way to tie in an animal theme that is truly customized to not only your nursery decor, but your child’s name. Judah’s parents contacted me about creating artwork that would be symbolic of the meanings of the first and middle names they had selected for their baby. For the first painting, they chose a lion and a lamb to represent “Judah”. For the baby’s middle name, they wanted an image that would symbolize words such as “counselor”, “sage”, or “wise.” After a few iterations, we came up with the colorful owl character pictured above. 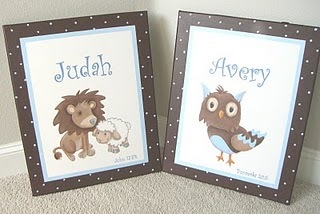 Judah’s parents also customized his paintings one step further, by adding a small reference to the bible verses that were inspirational to them when choosing the name for their baby. If you’re looking to do something similar for your own little one’s room, there are tons of websites now that provide the etymology and history behind your baby’s name. One I really like is Nickelodeon’s Parents Connect, but there are lots to choose from. Good luck, and have fun being creative with your ideas! Copyright © Bobo's Room Custom Nursery Artwork. All rights reserved.